Seen here is an image of the cup's molded and paint decorated handle. 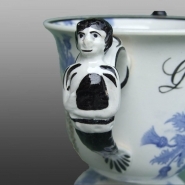 An image of the molded frog figure in the interior of the mug. An earthenware named frog mug with molded handles printed in blue with a design consisting of sprays of the thistle plant. Possibly Scottish. The size is unknown.